Join us and get wrapped up in the Quilt Trail this summer! August 10th-13th is a Summer Celebration of the Quilt Trail, hosted by Greeneville/Greene County! With quilt shows, artist lectures, the world premiere of “Pieced Together”, a Farm Dinner and a Motor Coach Tour. The full schedule of events is at www.nationalQTgathering.com. Wednesday Aug. 10th: 5:30pm – Free! –Unveiling of 3 new quilt blocks and the dedication of “quilt alley” outside the General Morgan Inn. Followed by a complementary reception sponsored by the General Morgan Inn. Thursday Aug. 11th – Friday August 12th – See below Schedule and full details, bio of speakers, time/location at www.nationalQTgathering.com. Tickets still available. * Thursday morning, 9:00am – Elizabeth Ellis, “Telling Your Story” – – $10 Tickets still available. “As a storyteller, Elizabeth Ellis doesn’t mince words. Filled with hilarious and poignant honesty, her stories deliver down home wisdom, southern style. Hers is a voice that finds the heart and the funny bone, riveting audiences of every age where ever she goes.”In “Telling Your Story,” Elizabeth will step us through the dynamics integral to good storytelling. *Thursday 3:30-4:30 pm – Patricia Mink, “Fibers Art and Modern Quilting” -$10 Tickets still available. Mink is an internationally renowned fibers artist and was recently featured in the PBS documentary, “Soul’s Journey: Inside the Creative Process.” Her work encompasses both contemporary and traditional quilting as she utilizes a broad approach in her technique. Her lecture will coincide with a showing of her work at Artspace 4 Gallery, inside the General Morgan Inn. World Premiere of Pieced Together, the first documentary about the Quilt Trail movement. -$10- Tickets still available. Watch the preview online: http://www.piecedtogetherdoc.com/. 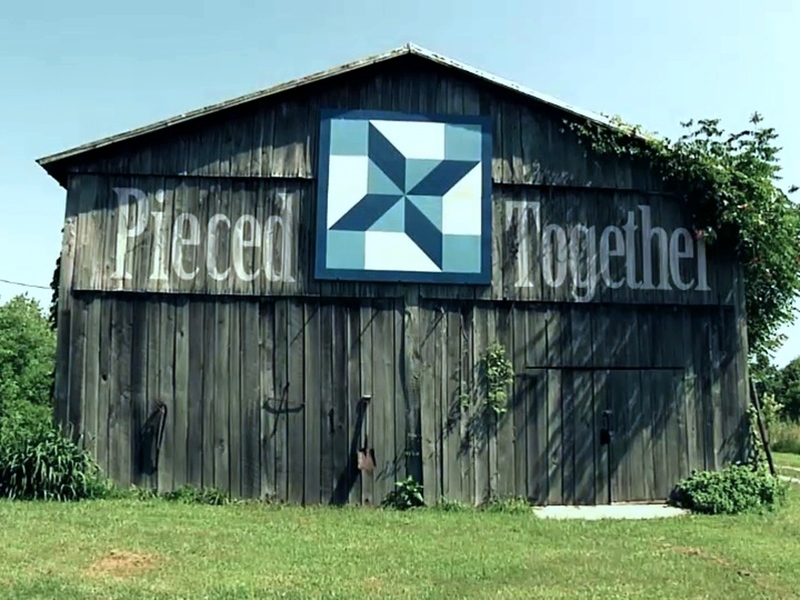 Using grassroots support, Julianne Donofrio directed “Pieced Together” – the first documentary film about the American Quilt Trail movement. “Pieced Together” tells the story of Donna Sue Groves, a breast cancer survivor who changed the American landscape by creating the barn quilt square trail. Donofrio is a Peabody Award-winning producer and veteran of ABC News, and is a freelance journalist living in New York. “Pieced Together” is her first documentary feature. Located at the historic Capitol Theatre in downtown Greeneville, this will be the film’s World Premiere. A dessert bar will be included w/ the $10 ticket. * Friday morning – 9:00am –Merikay Waldvogel, “Soft Covers For Hard Times” – -$10 Tickets still available. Friday Aug. 12th: Farm Dinner & Quilt Turning at Still Hollow Century Farm Tickets still available. This event includes many of our favorite things here in Northeast Tennessee; good food, good music, great company, quilts, and storytelling! This event will feature a traditional Bed Turning with quilts, storytellers from our local trail, mountain music, and a farm to table dinner.